This duo, struck bars paired up with blown bars, associates talented musicians of the same generation sharing the same passion. 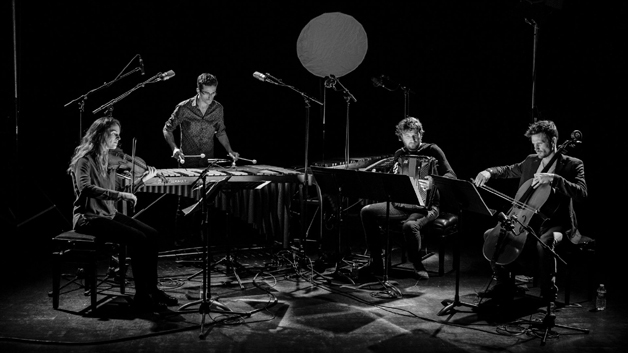 Their instruments present obvious similarities ( keyboards, polyphony, vibrating bars) although the ways of producing the sound are different but complementary.The chromatic accordion, the Vibraphone, the marimba all appeared fairly recently in the history of music.The three of them appeared at the beginning of the twentieth century, they play an outstanding part in all the spheres of the musical world : popular and traditional music, jazz ,rnodem and contemporary art music.The duo's originality resides in the association of percussion keyboards with the accordion, and in the way a dialogue is established between the instruments. They deal with a wide repertoire comprising the different musical spheres and demanding standards of composition and balance, linked with freedom and strong personality when improvising. Amazing, the smoothness between vibraphone and accordion, perfection in the harmonic blend of blown and struck, artists cohesion in their efforts to build the beautiful through art. Listening is the concept of keystone, a common attention to the brother of gesture in trip, each solo at the service of a story, a narrative and aesthetic rendering high ... "
This first recording includes compositions by Renaud Detruit and Pablo Pico, famous standard of Eddy Louiss, Bill Evans and Airelle Besson and two reinterpretations of Béla Bartók's "Mikrokosmos". Besides the originality of the formation, accordion / percussive keyboards, this album is bound by the strong personality of the musicians, which offers a refined music, creative and generous, in an aesthetic of jazz, contemporary music and chamber music. Renaud Détruit was born in Tours( 37). He studied music and percussion at the conservatoires of Tours, Boulogne - Billancourt and Orsay where he graduated in several disciplines. In order to broaden his field of knowledge he turned to jazz and improvisation under the guidance of Franck Tortiller. His career was strongly influenced by human and musical meetings. He belongs to a new generation of musicians eager to vary their artistic expression in a wide range of styles from chamber music to symphony orchestra, from contemporary creation to jazz ensembles and improvisation. After working with the French Navy Orchestra in Brest and playing with the Orchestra Symphonique de la Region Centre, the ensembles Itinéraire and Opus 16, the Mallet Workshop (as composer and arranger ) Renaud collaborates with Tours Symphony Orchestra, the National Orchestra of Lorraine, l'Opera en Plein Air, Atmusica (contemporary music ), the brass quintet Staccatours, the Mallet Horn Jazz Band ( horn big band ), ViBones Latin Jazz (Afro Cuban jazz 7tet ) the Synaptic Project ( composition, electro-jazz trio ) and with accordionist Florent Sepchat in a duo. He currently lectures at the Tours-Poitiers university, teaches percussion at the Tours conservatoire and accompanies jazz and contemporary dancing classes. Florent Sepchat was born in Caen in 1981. He starts playing the accordion at 10 and as early as the age of 15 he is hired in baller orchestras. He moves to Tours in 1999 in order to study musicology at the Francois Rabelais University. He obtains a degree in 2009, decides to take up a teaching career and qualifies as a music teacher. Meanwhile he also studies harmony and classical composition at the Tours conservatoire, trains in jazz harmony with Thierry Vaillot and arrangement with Claude Duchet at Tours Jazz school. From 2006 he entirely devotes himself to music and gains experience within various ensembles with a view to integrate the accordion where it si not necessarily expected. A composer and accordionist with La Goutte au Nez (alternative brass band ), OnzeH30 ( rock song ) he also studies traditional music with Loic Da Silva ( mediterranean, Balkan, Latin musics). He is actively involved in the musical association La Saugrenue, and plays with Ygranka ( Balkan groove ), le Balluche de la Saugrenue ( musette roots ), Choro de Aksak ( Brazilian music ). He currently performs all over France and abroad. He composes and performs in two creations( Risque by J. Retallack and Reine de la Selle de bains by H. Levin ) by La Tumulte, a contemporary theatre company. He also performs in Patrick Chamblas’s shows for children ( L' arbre a Swing and Réveil ).